When Britain entered World War I on August 4, 1914, Canada was still a part of the British Empire and automatically became part of the war, as well. The United States did not enter the war until April 6, 1917, when the U.S. Congress formally declared war against Germany. 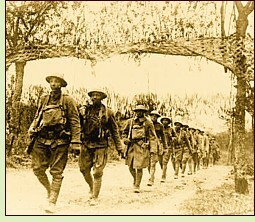 One of the ironies of the war, which according to U.S. President Woodrow Wilson was fought to make the world "safe for democracy," was that although both black and white American men were drafted, black soldiers served in segregated units and suffered pervasive discrimination, despite fighting valiantly. This page lists novels about Canadian and U.S. soldiers and auxiliary personnel such as nurses. A few classic novels written during or after the war based on the authors' own experiences are listed. These are not true historical novels, since they were contemporary at the time they were written. Patricia Anthony, Flanders (1998), about a Texan volunteer in the British army who experiences the horrors of trench warfare; written in the form of letters from the soldier to his brother in Texas. Joseph Boyden, Three Day Road (2005), about two young Cree Indian men’s war experiences. Robert Olen Butler, The Hot Country (2013), about an American war correspondent who travels to Mexico in 1914 to report on the civil war, and discovers a German ammunition ship docked at Vera Cruz; #1 in the Christopher Marlowe Cobb series. Robert Olen Butler, The Star of Istanbul (2013), about an American war correspondent and spy assigned to follow a German intellectual believed to have vital information on the Lusitania's fateful voyage; #2 in the Christopher Marlowe Cobb series. P.S. Duffy, The Cartographer of No-Man’s Land (2013), about a pacifist from Nova Scotia who enlists in order to search for his brother, missing from the front in France in 1916. Timothy Findley, The Wars (1977), about a young Canadian army officer’s war experiences. Thomas J. Fleming, Over There (1992), about a feminist and former pacifist who goes to France to work as a nurse on the front lines. Michael J. Goodspeed, Three to a Loaf (2008), about a Canadian of Anglo-German descent trained to impersonate a German-American with pro-German sympathies and go behind enemy lines to spy for Canada. Michael J. Goodspeed, Our Only Shield (2010), about a Canadian spy sent to German-occupied Amsterdam during the Second World War to determine the strength of the resistance; sequel to Three to a Loaf. Jonathan Hull, Losing Julia (2000), an elderly American recalls his World War I experiences and the love of his life. Kevin Major, No Man's Land , about the Newfoundland Regiment, which suffered more casualties in the Battle of the Somme than any other unit. Sarita Mandanna, Good Hope Road (2015), about two men who fight in the trenches in World War I, one from New England, the other from New Orleans, who struggle economically and emotionally when they return, and join the Bonus March. Anton Myrer, Once an Eagle (1968), about a Nebraska man’s army career, from World War I to Vietnam. Heather Parkinson, Across Open Ground (2002), about a young Idaho sheep herder drafted into the war and the effects of their separation on the woman he loves. Richard Powers, Three Farmers on Their Way to a Dance (1992), a literary novel about three farmers who go to war and their experiences. Jeff Shaara, To the Last Man (2004), about the United States’s entry into the war. Fred Stemme, The Lieutenant's Whistle (2012), about an American man who volunteers as an ambulance driver in France before America enters World War I, and falls in love with a Scottish nurse. Frank Yerby, Tobias and the Angel (1975), about the rebellious reaction of a man who begins seeing a guardian angel after he is wounded in WWI. Thomas Boyd, Through the Wheat (1923), about the U.S. Marines in World War I.
John Dos Passos, Three Soldiers (1920), one of the first realistic novels about the horrors of the First World War. John Dos Passos, 42nd Parallel (1930), an antiwar novel about World War I; #1 in the U.S.A. trilogy. John Dos Passos, 1919 (1932), an antiwar novel about World War I; #2 in the U.S.A. trilogy. John Dos Passos, The Big Money (1936), about the gulf between the haves and the have-nots in the post-war 1920s; #3 in the U.S.A. trilogy. Charles Yale Harrison, Generals Die in Bed (1930), a novella about a Canadian soldier and his experience of trench warfare. Ernest Hemingway, A Farewell to Arms (1929), about an American ambulance driver serving in the Italian army. Dalton Trumbo, Johnny Got His Gun (1939), an antiwar novel about a soldier maimed in World War I.